I am a nut for crusty bread. I love the crunch that the caramelized brown crust provides. I found a super easy recipe that involves absolutely no kneading. Total prep time for this bread was around ten minutes. Mix all of the dry ingredients together in a large bowl. Add the water, thenquickly mix the ingredients with your hand, just long enough to incorporate everything into a mass. It shouldn’t take longer than ten seconds to mix it. If you’re taking longer than that, you’re working the dough too much. I had to add a bit more water (maybe ¼ cup) to get the dough sticky enough. Once incorporated, add a tablespoon of oil to the bowl (or spray the sides of the bowl with nonstick spray). Seal the bowl with plastic wrap, and set aside for at least twelve hours. Seems like a lot, but you need to give the dough enough time for the yeast to work its magic and for the gluten to develop. Once the twelve hours are up, lightly pat the dough down, then fold the dough in no more than four times (see the video link at the bottom of the post to see what I’m talking about). Cover the bottom of the dough with corn meal and the top of the dough with a light coating of flour. Let sit for 10 minutes. Meanwhile, pre-heat your oven to 500 degrees. Yes, 500. It needs to be blazing hot to make sure the dough develops a caramelized crust. If you have a cast iron enamel pot, like a Le Creuset, place it in the oven and allow it to pre-heat as well. Now, a word of caution: my Le Creuset discolored on the outside as it reached about 425 degrees. I’ve been told that they can comfortably go up to over 500 degrees, but you may want to do a little research to find out for yourself. I also covered my lifting knob with aluminum foil to prevent damage. Once everything is preheated, throw the dough in, corn meal side down, immediately cover, and put it in the oven. The beauty of using the Le Creuset is this: the pot traps in the escaping moisture from the dough, which then circulates around the dough in the pot. This is what develops the beautiful crust on the bread. As the starches heat, they turn into both a gum and sugar, which then caramelizes. This is what gives bread crust texture, color, and wonderful flavor. If you don’t have an enamel pot, another technique is to get a pizza/bread stone, place it in the oven to preheat up to 500 degrees, and place a pyrex pan filled with water either beneath the stone or to the side. Throw the dough on the pizza stone, and the evaporating moisture from the pan will help increase the humidity in the oven. I’ve done both methods, and the Le Creuset method is much superior, but you can still get decent results with the stone. Bake until the crust is a very dark golden brown. It’s recommended to cook the bread for about 2/3 of the time with the lid on, and 1/3 of the time with the lid off. My small loaves only took about thirty minutes to bake, so doing the math gives me twenty minutes with lid on and ten with lid off. Ovens vary, so just make sure you start checking on it about fifteen minutes in. But don’t open the oven for at least the first ten minutes as the crust develops. You need to keep every last bit of moisture in the oven that you can. Once baked, pull out and allow the bread to cool down. This is important and the crust will continue to harden and develop as it cools. 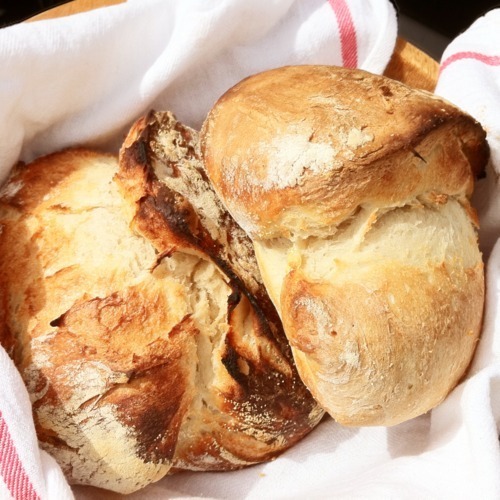 Get some bread and jam or some oil and vinegar, and you’re ready for a treat! Experiment with different additions like garlic, onions, cherries, etc. I think I’m going to try a cranberry white chocolate loaf next. Check out this video which shows the above process. Especially take note of how little time he spends mixing the dough.